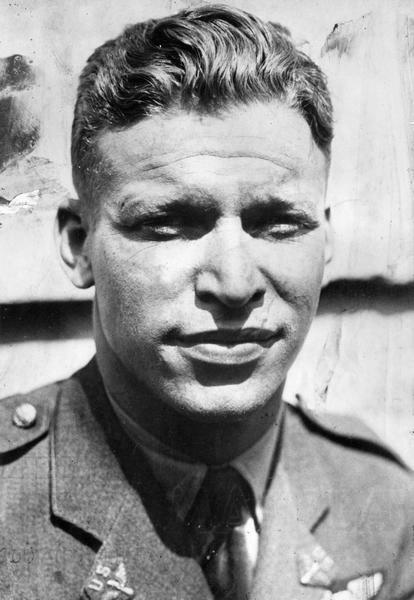 Head and shoulders portrait of Lester Maitland, who was a U.S. Army Air Service pilot from Milwaukee who served as aide to General Billy Mitchell during the 1920s. In 1927 Maitland and Lt. Albert Hegenberger completed the first trans-Pacific flight from California to Hawaii. Although the acclaim given Maitland and Hegenberger for their accomplishment was limited in comparison with adulation for Lindbergh whose trans-Atlantic flight had taken place only weeks earlier, their accomplishment was possibly greater from a naviational stand point. Maitland remained in the Army Air Force, serving as a general during World War II. He later became the first director of the Wisconsin Aeronautics Commission.This image was purchased from the Milwaukee Journal. Double credit should be used as a result.